Before the Las Vegas Strip, there was Fremont Street. The east-west artery cutting through downtown Las Vegas was the heart of gambling after the State of Nevada legalized casinos in 1931. The state’s very first gaming license went to the Northern Club at 15 E. Fremont St. Even as the casino action eventually migrated southward to grander facilities along S. Las Vegas Blvd.–the Strip–Fremont Street held its own. It was on Fremont Street that Buddy Binion’s Horseshoe Casino in 1970 started the World Series of Poker, now the world’s largest such tournament. Today, there’s the Fremont Street Experience, a five-block-long pedestrian mall festooned with neon, much of it under a 90-foot-high canopy. After the Strip, Fremont Street is undoubtedly Las Vegas’s best-known street. And, in my judgment, one with a most distasteful provenance. For Fremont is named for a war criminal, who despite that background became the very first presidential candidate of the Republican Party a long time ago. And you thought Donald J. Trump carried some baggage in the GOP. 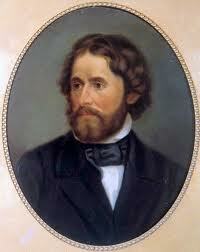 The street is named for John C. Frémont (1813-1890), whose accent acute today is frequently omitted. In the middle of the 19th century Frémont carved out quite the national and even international reputation in a variety of realms–military, politics and business. Plus a little race-based wartime murder. Not just once, either. Much of this account is drawn from an essay I wrote five years ago this month–long before becoming New To Las Vegas–for an earlier blog of mine, NewToSeattle.com. Fremont happens to be the name of one of liberal Seattle’s most liberal neighborhoods–so liberal it has a clothing-optional parade every summer solstice, not to mention a statue of Lenin–a delicious irony in my view. Some of my background research into the life and times of Frémont also found its way into Offside: A Mystery, my 2014 novel about race relations (and soccer) in California. A Georgia native born out of wedlock, Frémont was expelled from military college for bad attendance. Nevertheless, he eventually joined the Army. Largely inept as a soldier, he found he had a terrific sense of P.R. and an extraordinary amount of luck. It also didn’t hurt that he married very well, the daughter of a powerful U.S. Senator from Missouri. Rising eventually to the rank of major general, the good-looking Frémont, who held a high opinion of himself, cultivated the press and got insanely favorable coverage. He probably was the country’s best known military officer, which was saying something. (How many major generals today can you name?) The scribes called Frémont “The Pathfinder” or even “The Great Pathfinder” for his mapping (and spying) expeditions across the West. Most of the time, though, it was his equally famous sidekick, Kit Carson, doing the pathfinding. However, Frémont, a prolific author, had a definite way with words; it was he who dubbed the entrance to San Francisco Bay the Golden Gate. One of those trips brought Frémont on May 3, 1844, to the future Sin City, a barely populated desert oasis whose spring waters, he wrote, were too warm for drinking but wonderful for bathing. Still, Vegas sat on the somewhat convenient Old Spanish Trail–yes, Frémont bestowed and popularized that name, too–connecting Santa Fe, N.M. and Los Angeles. A map and report he put together that was published by Congress is credited with guiding thousands of immigrants to the West, especially after the 1848 discovery of gold in California. Frémont’s travels through the West, then largely part of Mexico, eventually became part of U.S. President James K. Polk’s implementation of the policy of “manifest destiny.” That was the notion of a God-given right that the United States, then confined to the eastern half of North America between Canada and Mexico, should grab the other half, especially California. Latinos and Indians be damned, especially if Yankee Gringos hankered after their land, which, of course, they did. Polk’s initiative was another spectacular example of that Frémont luck. In early 1846 Frémont was in the right place at the right time, commanding his squad of well-armed “topographical engineers” sniffing around Northern California when Polk, unquestionably America’s most effective one-term president, made his move. Mexican military authorities had ordered Frémont and his men to leave, which, after a fake show of force, they did, moving north to Oregon, outside of Mexican jurisdiction. Polk sent a courier with orders for them to return to California. But Klamath Indians upset about the U.S. incursion into their ancestral trial area and understandably fearing the worst attacked Frémont’s unit and killed three men. He ordered retaliation on a massive scale. His troops sent several days moving around the 87-mile perimeter of Klamath Lake killing every Indian they could find–as many as 14 at one time–and making little effort to determine the guilty parties. Since Frémont’s troops had guns and the Indians had bows and arrows, it really wasn’t much of a fight. His men found it particularly sporting to pick off Indians at long range. Now a genuine war criminal, Frémont expressed great satisfaction with his actions. “It will be a story for them to hand down when there are any Klamaths on their lake,” he said. He wasn’t referring to elk or deer. The Mexican War was still under way when Frémont’s army reached San Rafael, just north of San Francisco. His troops spotted three innocent, unarmed Mexican settlers–an elderly man and two nephews–crossing a waterway toward them. Using a telescope, Frémont himself watched the small boat as it neared the shoreline. Frémont airily waived his hand. “I have no room for prisoners,” he replied, according to a witness account the Great Pathfinder never disputed. His answer amounted to a death warrant. Using their rifles at point-blank range, Carson and two soldiers eagerly gunned down the helpless Californios. They then reported back to Frémont what they had done. “It is well,” he said approvingly. His soldiers then stripped the dead bodies of all clothing. Frémont rebuffed one dead man’s son who asked for return of his father’s poncho. For Frémont, the rest of the Mexican War solidified his reputation as a man of action, if nothing else. He quickly captured largely abandoned Monterey, the Mexican military capital of California south of San Francisco, then sailed down the coast toward Los Angeles. Team Frémont triumphantly marched into the City of Angels but was forced to retreat by outraged civilians who were better shots. But in early 1847 he returned, signing (without any authority whatsoever) the cease-fire that essentially ended the Mexican War and firmly brought Nevada into the U.S. If they’re on the wining side, war criminals are never made to account for their atrocities. That certainly was true of Frémont, although he was court-marshaled, not for the massacres, but for insubordination, essentially showing up his superiors. Meanwhile, he bought a 44,000-acre ranch near California’s Yosemite Valley (using inside information he gained while surveying the land for the military) from someone who did not have clear title. When gold was discovered in the vicinity–that old Frémont luck again–he worked to alter the boundaries of the defective deed to cover some of the gold lands and evict miners already at work there. In 1850 Frémont became one of California’s two inaugural U.S. senators, chosen by a state legislature dominated by Yankee interests. But he spent so much of his time in Washington looking after his land holdings that disgusted lawmakers denied him another term. Frémont rejoined the military on the Union side for the Civil War, but fellow Republican Abraham Lincoln fired him for grandstanding on the issue of slavery (Frémont wanted to push for abolition far faster than his Commander in Chief). After the war Frémont peddled worthless bonds in Europe for a sketchy U.S. railroad, blew through his gold fortune and went bankrupt. He died in 1890 broke but famous and celebrated in many, many circles. Despite Frémont’s murderous actions toward Indians and Mexicans–which occasionally surfaced as issues during his political career–a lot of things around the country are named after him. They include rivers, islands, mountains, streets, schools, libraries, hospitals, cities, counties–and one glittery street in Las Vegas that is still hanging on.